Hmm… can a Black President actually be ‘politically black’ for real? What does that even mean? What did Barack Obama’s Presidency mean… to you? Great quote. We still have work to do, but great quote. And this documentary episode, too. So you know when we learned that Liza got to interview the POTUS, Barack Obama? Well, I went looking annnnnd BOOM! Here’s the thing: We CAN agree without being disagreeable. We can ALL be of one nation and be completely opposite in our views, even values. BUT we should value AND respect each other. And we should expect the candidates – yes ALL candidates – to AT LEAST hold to that level of decorum. We have seen when they have not. Watch here though, when the guy I did NOT vote for showed RESPECT for his opponent. John McCain, stood tall here. Gave respect to his opponent, who would become President. Remember, folks. The person running against your person is not ‘bad’ for that reason. Give credit when earned and respect when it is due. Respect Senator McCain. Respect. President Barack Obama and First Lady Michelle Obama celebrate their final holiday season at the White House. In the above video, the Obamas lay out some of the country’s achievements over their terms in the White House, include some reminders of how great America is and can be, as well as a call to remember those who serve and protect the U.S. even over the holidays. Join them in supporting America’s service members and families, now and year-round, at JoiningForces.gov. Merry Christmas, Mr. President & Madam First Lady. Come back from a 3-1 situation to win the NBA Finals… and a trip to the White House. How dope is that? Please watch footage from the Cavs visit with the U.S. President and First Lady, as well as Vice President Joe Biden. And reeeeally watch as Present Obama daps-and-back-pats the bruhs while offering ‘official’ handshakes to the rest. Just like on Key & Peele. Hahaa! Respect and honor to the veterans assembled there, and to all who’ve served. Just like First Lady Michelle Obama and the Cavs showed. Well, here it is… After about 8 years of cosigning, campaigning, contributing and cajoling… Bill Maher gets a sit-down with the President Of The United States aka POTUS aka President Barack Hussein Obama! President Barack Obama sits down with Bill Maher on the eve of the election to discuss the issues Real Time viewers care about. Original air date: November 4, 2016. Great conversation! Cannot say it was worth the wait because a lot of this talk has been said by the President and his administration all along. After watching, you’ll probably agree that (while a studio appearance would have been awesome & appreciated) this choice of format and venue (directed Q&A at the White House with plenty of time to talk) was the best way to go. We get to hear all of what the President had to say in response to all of what Maher wanted to ask on his viewers’ behalf. You REALLY want to watch the ENTIRE interview, especially if you are an American (regardless of party, belief, etc.). Not sure how Hollywood figured out that we’d need something a bit more palatable to wash away the nasty politics of the current U.S. Presidential Campaign. But then again, looking back, how could we not. At the very least, we’ve known and come to realize that a wildly popular – and by most accounts credible & and accomplished – President and First Lady were leaving the White House. We knew that there were no contenders to take up residence with the Obamas’ mix of composure, competence and charisma. That was sad enough. And just when we thought we’d dug through the mud & sh!t and hit rock bottom, somebody threw down a jackhammer so we could dig for oil and bodies and get even nastier. Did you SEE the 3rd Presidential Debate? The candidates can’t even shake hands. But that phase is over now. Early voting has begun and the dust will settle after November 8th. Just in time for us to enjoy some farewell level good cinema. Remember the future First Couple’s first date movie (“Southside With You”) we posted on here? Well, Netflix is bringing us another back, back in the day flick… talking about way back when Barack Obama was “Barry.” It won’t have as softened a tone as the aforementioned ‘date movie’ but viewers can draw strength knowing that even their President had it rough. A young Barack Obama, known to his friends as “Barry,” arrives in New York City in the fall of 1981 to begin his junior year at Columbia University. In a crime-ridden and racially charged environment, Barry finds himself pulled between various social spheres and struggles to maintain a series of increasingly strained relationships with his Kansas-born mother, his estranged Kenyan father, and his classmates. Barry is the story of a young man grappling with those same issues that his country, and arguably the world, are still coming to terms with 35 years later. On Netflix December 16. Check out the trailer above. Should be good watching. Great interview (slash moderated debate-type discussion) featuring Eddie Glaude and Michael Eric Dyson by DemocracyNow. Strap in for some informative, intellectual exploration of approaches to the Democratic platform, President Obama’s actions and legacy, Former Secretary and Presidential candidate Clinton’s past and anticipated actions should she ascend to U.S. Commander-In-Chief, and SO MUCH MORE! Of the two, I agree with Eddie Glaude. Just getting that out there. In short, climate change is real, healthcare is affordable, and love is love. As much tongue-in-cheek, as cheeky humor, this sketch again allows President Obama to play ‘straight’ as he communicates his administration’s successes while Jimmy Fallon and Tariq go in with the silly singing; all backed by The Legendary Roots Crew. Guaranteed chuckles and kudos on the coolness of America’s Commander In Chief. All you gotta do is press play, baby. Before they were the Prez and First Lady… before they were perhaps one of the world’s most adorable couples… there had to be a first date. This is that story. Inspired by Barack and Michelle Obama’s first date, “Southside With You,” recounts the eventful summer day in 1989 when a young law firm associate named Barack Obama (Parker Sawyers) tried to woo lawyer Michelle Robinson (Tika Sumpter) during a daylong date that took them from the Art Institute of Chicago to a screening of Spike Lee’s “Do the Right Thing” to the site of their first kiss outside of an ice cream parlor. Eight-year-old Amariyanna Copeny, American citizen, Flint, Michigan, resident called on her President… and he responded. He came to see her in Flint to do so. Check out the AWESOME video of their interaction and President Barack Obama addressing the crowd that gathered. When you really think of it, The Obamas are doing stuff that is really seen of First Families after they leave the White House. But as Martin Luther King, Jr. quipped, “The time is always right to do what is right.” And this promo spot – featuring President Barack Obama and NBA standout Steph Curry – for the My Brother’s Keeper mentoring initiative… it’s the right thing. Plus, it’s pretty dope. Cool clip of the Golden State Warriors’ White House trip. Know who else is a trip? President Obama. He welcomed the NBA champs to the house, as is custom, and gave ’em a good ribbing. Steph will most def be working on his jump shot form thanks to The President’s wisecracks. Haaa! This “Comedians In Cars Getting Coffee” episode is everything fam. 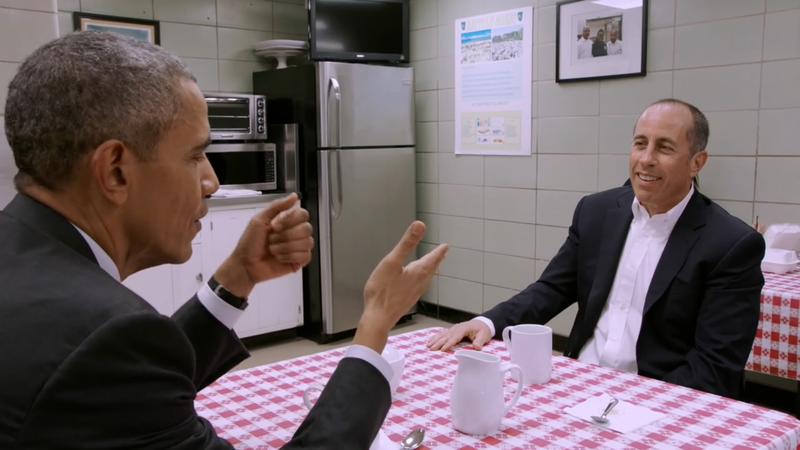 By far, the biggest “get” ever on Jerry Seinfeld’s show: President Barack Obama. Still… the baby blue 1963 Corvette Stingray Split Window Coupe he showed up in… classic sickness! Too bad they aren’t actually ‘going’ anywhere to get coffee. Seinfeld: Uh… we’re just gonna run out for a quick coffee. We’ll be right back. White House Security Guard: I’m sorry, sir. That’s not possible. White House Security Guard: You’re a comedian with the President going nowhere. Back it up. Watch. And peep, the President’s got jokes… and some pretty cool tech in his car. After finishing Fixing the System, our HBO special report about America’s broken criminal justice complex, VICE traveled back to El Reno Federal Correctional Institution in Oklahoma, to screen the documentary for inmates and staff. We then asked them about President Obama’s historic visit to the prison and their thoughts on the documentary. Watch their reactions above. Just in case you missed it, we got that full episode of VICE on HBO’s Special Report featuring President Obama’s historic prison visit, meeting with federal inmates and his sit-down conversation on “Fixing The System.” But don’t just watch for the Prez. Informative and heartbreaking right from the start.